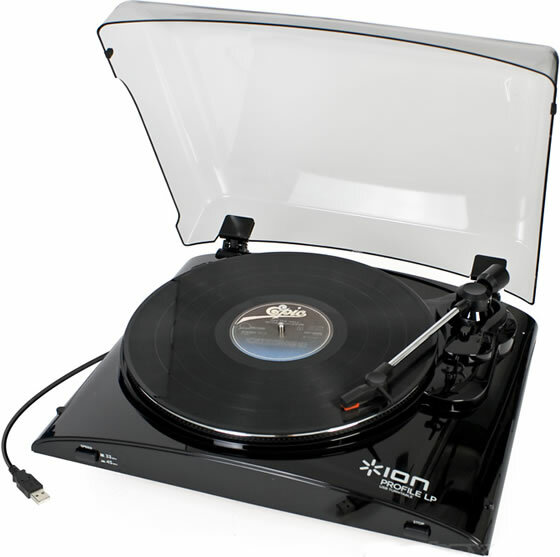 This week's poll question is about record players that can turn Vinyls into MP3s. Discuss here if you would like to get your groove back with some of your old records, and, if you like, the poll results themselves. I helped my best friend convert vinyl to mp3 about 10 years or so back. I never collected records myself but he has over 300 if I'm remembering correctly. I'm currently in the process of converting lots of vinyl into digital with one of these. I load them into my GPS and drive the kids nuts on road trips. 8 hours to Maryland next week. Their heads just might explode! I went through the process a few years ago using a turntable connected through a pre-amp to line in and then used Audacity to clean them up, convert to mp3 & then re-burn. Very time consuming, but well worth it in the long run. Only did LPs which I couldn't find ever having been reissued on CD. Problem with the 'all-in-one' solutions is that you don't get a lot of chance to remove scratches etc unless you use something like audacity afterwards. › If world at war ..Can we connect to WORLD WIDE WEB ? My dad has a turntable/cassette player that can output to a flash drive or CD-R. The output quality isn't great, and the MP3 encoder tops out at 160Kb/s. Why, Dad? As a vinyl aficionado you should've known better! I still play my vinyl collection the old school way: with an old Pioneer PL-518 turntable connected to my Onkyo receiver. I can even Pro-Logic them to 7.1 surround (but I never do; that'd be as silly as converting them to MP3). If you listen to them a lot this might be a nice idea but personally my vinal collection is worth thousands more now than mp3s ever will be. If I want the music on a cd or mp3 player I just download it. There is nothing wrong with creating MP3s to use in the car, for instance. I see not conflict with doing that and being a purist. I have lots of vinyl from the 60's. I haven't gotten around to ripping MP3s off them. One of these days. I still have my stereo setup from the 60's. Sansui 5000, Dual 1019 changer, couple of Sony reel to reel decks, Poineer 3 way speakers with 15" woofers. All that gear is in my basement entertainment area. I can play off the original media or have a Athlon 700 computer setup as a juke box which I push through the Sansui. Need all 2000 sq.ft. in order to crank up those speakers. Vinyl is great but you need a turntable that isn't going to grind the platter down. My Dual has a cartridge that plays at 1/2 oz pressure on the arm. That doesn't do much damage to the vinyl. I am not that much of a purist anymore because my hearing is shot anyway. Still love music but I don't hear the entire range, especially when the volume is set for most folks. re: If I want the music on a cd or mp3 player I just download it. Yeah, but then you lose the part of the song where Elton John drops that one syllable two thirds of the way through "Burn Down The Mission" or the Pop! just as Jimi says "So? Are you experienced?" Those are the ways that I remember those songs, not the pristine version I'll get with the download. Each of those little glitches brings me back to a time that has tons of memories (good and bad) associated with it. I don't want to give those up. There is a nice little gizmo around called "Gemini iKey Plus" (or there was, because I have one). This is plugged into your stereo and will put anything that is playing onto a flash drive stick. This incudes stuff from a gram deck if you have one. I have a utility that that will basically monitior the sound card and capture any audio that is played through it. I don't recall the name (it's on my home system) but if anyone is interested, I'll get it. However, the difference with Gemini iKey Plus is that it records from your stereo onto a flash stick, rather than the computer. This means that you don't have to wire up your gram deck (or whatever) to the computer.